Tottenham captain Hugo Lloris has defended Manuel Neuer following criticism and has hailed his Bayern Munich counterpart as the best goalkeeper in the world. Germany number one Neuer has struggled to regain his best form since returning from a long-term foot injury shortly before the World Cup. Bayern's recent run of poor results and their skipper's unconvincing display in the Nations League defeat to Netherlands led to debate over the extent of his loss of form. 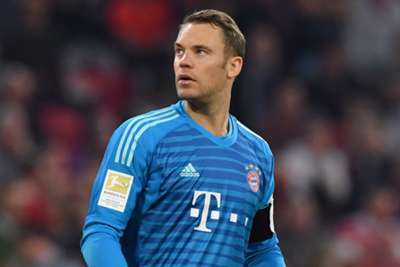 Germany great Lothar Matthaus urged Joachim Low to drop Neuer in favour of Marc-Andre ter Stegen, but Lloris is adamant the six-time Bundesliga winner remains as good as any of his contemporaries. "Judging by all that he has brought Bayern and Germany, this discussion is not fair," the France shot-stopper told Sport1. "It's not easy if you have not played football for nearly a year. He's still on a great level and a great goalie. Hugo Lloris: "There is no doubt about @Manuel_Neuer. He's such a fantastic player. For me, he's simply the best." "As goalkeepers, we are always very dependent on the team and if the team is not working properly, the goalie sometimes looks bad too. "He's just the best for me, there's no doubt about Manuel Neuer. He's such a fantastic player, he'll prove it again in the future." Neuer has started all seven of Bayern's league matches this season, keeping two clean sheets.